With ever increasing security and compliance requirements and proliferation of many client devices that vary in form factor and different security requirements, desktop virtualization downloaded from a data center is the most relevant technology to streamline client device management. By separating operating systems (OS) and applications from a physical client devices, virtual desktop infrastructure (VDI) streamlines management, lowers operational expenses and facilitate security and policy adherence. Thousands and even millions customer devices, mostly in the form of mobile clients or real-time sensors require automated management. Such complexity will be manageable only through centrally administered software. Therefore enterprises are advised to migrate to complete virtualization of devices so that all control software is removed from individual devices where the embedding of security cannot be achieved. Because of the need to shift the management of clients from 2nd generation client servers to 3rd generation cloud computing such transfer of control represents a radical change in the architecture and in the organization of information technologies. The virtualization of customer-operated computing devices removes all software from the customer and leaves only a secure browser (“thin client”) available for access to computing resources. Applications, infrastructure services, security and access to data remain under the management of the data center cloud software. 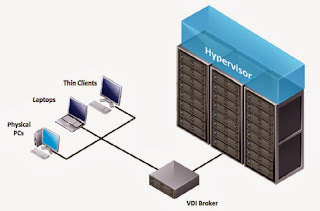 VDI workloads are highly variable in terms of the demands they place upon the capacity and security of the supporting storage infrastructure. Each time a client browser accesses the central cloud, application or user data, it generates requests for the storage infrastructure. There are periods of time when multiple client devices access large amounts of data. Typically, this occurs when a large number of virtual devices simultaneously boot, login, perform virus scans, or log-off. If the storage is not able to service these requests with acceptable latency, the client devices fail to perform. The effects of these capacity overloads are handled by allocating additional disk capacity. This results in capacity overprovisioning, and decreasing cost-efficiency. This calls for migrating the storage available at the client site to the enterprise datacenter. Enterprise storage provides higher reliability and performance, but also at sites where economics of scale offer lower cost than the client-attached storage. For the deployment of enterprise-class storage management must carefully allocate storage capacity. Overcoming these challenges requires tight integration between storage and the hypervisor in the cloud. This integration is designed to deliver optimal storage performance and lower costs while simplifying VDI deployments. This also enables improved scalability through features such as fault-tolerant load balancing and intelligent management of multiple network paths, which allows improved data availability. • Simplifying the application of security policies and updates to end user desktops as they are all in the data center. Another way that desktop virtualization improves security is by offering the ability to utilize host‐based antivirus and anti‐malware. Host‐based means that antivirus/antimalware applications can run on the hypervisor host instead of on each end user desktop. This setup not only saves the time of installing all those agents but also the time to maintain those agents and the processing overhead of running one agent per host instead of one agent per desktop. Host-based antivirus and anti‐malware tools offer centralized control, efficient design, reduced resource utilization, and simplified administration. Two‐factor authentication can easily be integrated into desktop virtualization solutions to provide a higher level of security. Thus, an end user would need not only a username/password but also a password or number from a security token to access their VDI. The shift to VDI has resulted to a major change how an enterprise of the future will operate its information technologies. It represents a change in the relationship between customers and the IT organization due to reliance on public or private clouds. It predicts increased reliance on IT services that can support increasingly complex cyber defense requirements. There will be a number of organizations that will offer VDI connectivity with easy access to transaction pricing for making competitive comparisons. • The shift to VDI connectivity will results in the adoption of vastly improved cyber security thus dictating the migration of 3rd generation computing based on cloud operations. • The shift to VDI will not only reduce operating costs but also safeguard enterprise operations in an era of rising security threats.